The aim of The English International College is to provide opportunities for our students to discover, explore and develop their talents in a friendly and supportive atmosphere that encourages academic and personal achievement. Group visits to view Foundation Stage begin in October of each academic year and follow through – subject to availability – until February for those families registered on our Initial Enquiry list,. Families are contacted in order of date of submission of the form. Please complete an Initial Enquiry form and return this to us with a clear copy of a last school report. Individual visits can be organised on a mutually convenient date during term time. Depending on your child´s year group on entry, you will have the opportunity to meet a senior member of the academic team. During this visit you will visit campus and an Entrance Assessment can be programmed into the visit, if relevant. As part of the admissions process candidates are offered a first interview to discuss their predicted grades and option subjects they wish to study. 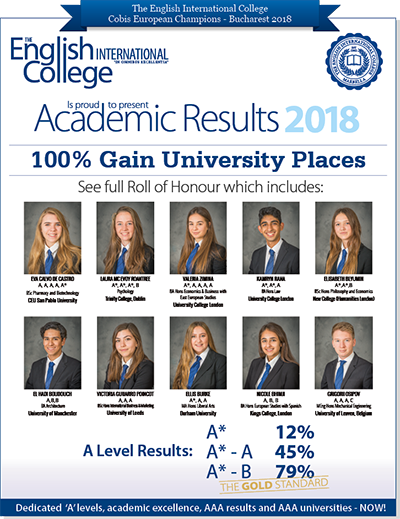 Conditional offers may be made and will be confirmed once (I)GCSE results have been submitted to Admissions in August. Once a year we do hold “Open Doors” for all our EIC parents and this gives the Registrar the opportunity to invite families who are interested in the school to join the event.